Near Space is a region where few aircraft can tread. Floating high above the jet stream, lighter-than-air ships are now deemed as a way to loiter at length. They appear ideal for keeping tabs on a foe's troops or delivering telecommunications services to your own warriors. From on-high, sensor-laden platforms might gaze at weather or monitor a huge expanse of airspace as part of a ballistic missile defense shield. Supporters of high-altitude platforms contend they can deliver services on a par with Earth orbiting spacecraft--at far lower cost. General Lance Lord, Commander of the Air Force Space Command, touched upon emerging Near Space attributes at an October 20th Pacific Space Leadership Forum in Hawaii. Near Space is between 65,000 feet (20 kilometers) and 325,000 feet (99 kilometers) above sea level. "The fact is space has transformed the modern battlefield. We are more precise, more efficient, and more combat effective because of space. We are also less destructive, less likely to inflict collateral damage, and less likely to go to war because of space," Lord said. "If you can tie it to a balloon you can get it to Near Space, our prototyping efforts with communication and imagery platforms [are] showing promise towards giving us a low cost persistent world-wide presence." Lord's keenness was bolstered by Near Space demonstrations done earlier this year by the U.S. Air Force Space BattleLab at Schriever Air Force Base, Colorado. Tests of balloon-borne ground-to-ground and ground-to-air communications systems were staged to show the effectiveness of a low-cost, simple solution to meeting warfighter communication needs. The trial runs involved balloon-borne SkySite command and control platforms developed by Space Data Corporation of Chandler, Arizona. Space BattleLab is now adapting this system to provide a platform for its Combat SkySat communications system, part of the laboratory's Near Space initiative. Near Space is an altitude that is virtually unused currently - higher than planes fly, but below satellites. It is also a height that is above weather and most weapons systems that can do you harm, explained a BattleLab's statement on the tests. In addition to this activity, also on the BattleLab's current initiatives roster is a Combat Sentinel Near Space and a Near Space Maneuvering Vehicle project. The Johns Hopkins University Applied Physics Laboratory in Laurel, Maryland is delving into unpiloted spy ships too, but of the disposable kind. The High Altitude Reconnaissance Vehicle (HARVe) would operate in Near Space, staying in one spot for roughly two weeks to 30 days. It would supply to military officials on the ground 24/7 (24 hours a day, 7 days a week) coverage of select areas on Earth. According to APL's Bob Behler, Precision Engagement's business area executive and the project lead, the HARVe would be ejected from either a cruise missile or possibly a reusable rocket. A second booster would propel the vehicle to about 300,000 feet above sea level, and then the ship would inflate and descend to hover over a target area at about 100,000 feet. HARVe could carry out radar and imaging missions, protect and track friendly forces, appraise battle damage and carry communications nodes. After the two weeks to a month, the vehicle would either disintegrate or be destroyed. "We see the use of high-altitude, lighter-than-air vehicles in the 70,000 to 100,000 foot range as a tremendous, real asset to communications, surveillance and target acquisition for the military," said Tom Millett, Executive Vice President of Millennium Airship Incorporated (MAS). The company's corporate offices are located at Bremerton National Airport in Port Orchard, Washington. Millett said, however, that several significant problems need to be overcome. "The primary one is the ability to recharge the air vehicle's power source," Millett told SPACE.com, noting that passive regeneration of batteries does not handle the electrical load required. "We have the ability to regenerate the air vehicle power through a laser source. While this system is still in development, it shows great promise," he added. One other issue is anchoring the air vehicle in the right location. Within its proprietary technology toolbox, MAS has a very small position control system that could solve this issue, Millett noted. As for the overall utility of high-altitude air vehicles, Millett said they would be cheaper to launch and maintain than satellites and could be placed in strategic locations very easily. There are, however, several overall problems to be resolved--such as weight to be placed high above terra firma, durability of the air vehicle, power regeneration, and several others. But Millett said "we believe the benefits of high-altitude air vehicles are numerous and would be a very economical solution to communications over specific regions on the globe." Millennium Airship has recently steered its design talents toward a "SkyFreighter". This heavy-lift, but lower-altitude flying vehicle is envisaged as augmenting the already burdened sea and air cargo business. 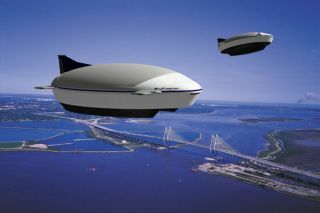 Other countries are eyeing large stratospheric airships too. For one, an aeronautic research arm of the Japan Aerospace Exploration Agency (JAXA) is sponsoring the Stratosphere Platform Project. They see a network of huge unpiloted airships that stay afloat high in the stratosphere, outfitted with telecommunications gear and sensors. From their aerial positions, broadcasting, Earth observation, and disaster monitoring could be executed. Then there's Sanswire Networks, LLC, engaged in "out of the atmosphere thinking". The firm is taking their wireless broadband network ideas to new heights. Sanswire Networks is a wholly owned subsidiary of GlobeTel Communications Corporation of Pembroke Pines, Florida. Sanswire is prototyping a High-Altitude Airship Platform. Called a "Stratellite", it would transmit various types of wireless communications services currently handled from cell towers and satellites. A Stratellite airship is 100 percent reclaimable, utilizing proprietary lifting gas technology. A concept, company officials report, could be exploited for many military and government uses like secure communications, border control, Homeland Security duties, Earth remote sensing and surveillance, battlefield control, as well as climate research. In August, the Defense Advanced Research Projects Agency (DARPA) awarded two contractors first phase dollars for the Walrus program--a heavier-than-air vehicle that produces lift through advanced breakthrough technologies in aerodynamics, thrust vectoring and gas buoyancy generation and management. Lockheed Martin Corporation's Advanced Development Programs of Palmdale, California and Aeros Aeronautical Systems Corporation of Tarzana, California were granted roughly $3 million each in funds. DARPA's Walrus wishes are to develop and evaluate a very large airlifter. In particular, Walrus is seen as moving loads of up to 1,000 tons across international distances. Supporters of the concept foresee a complete Army brigade carried by Walrus, right from "the fort to the fight." Given the fact that airship work appears to be on the rise--from lower altitudes all the way up to stratospheric heights--what about classes of these sky trekking airships able to transport rubbernecking tourists? That idea hasn't escaped one team of architects. The hotel and resort designer group, Wimberly Allison Tong & Goo (WATG), has already sketched out some thoughts on a comfy-looking airship hotel. And back in 2000, a study group of the International Space University (ISU)--comprised of 40 young professionals from 21 nations--produced the report: Space Tourism -- from Dream to Reality. The study was done as part of ISU's summer session, held at the Universidad Tecnica Federico Santa Mar'a in Valparasio, Chile. One of their comments was that high-altitude balloon flights carrying passengers could help generate public interest in suborbital and orbital jaunts.